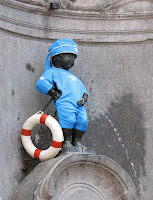 I realize this is a family-friendly website, but have you heard of Manneken-Pis? Also known as le Petit Julien in this bilingual country, that’s the real name of a famous landmark and popular tourist attraction in Brussels, Belgium. Manneken-Pis (translation: little man pee) is a statue of a naked little boy going pee. My brothers and I loved going to see it when we were kids. As we all know, boys under the age of about 25 12 are obsessed with toilet humor and bodily functions. The jokes and laughter coming from men little boys upon visiting this statue will lighten up every weary member of a traveling family. 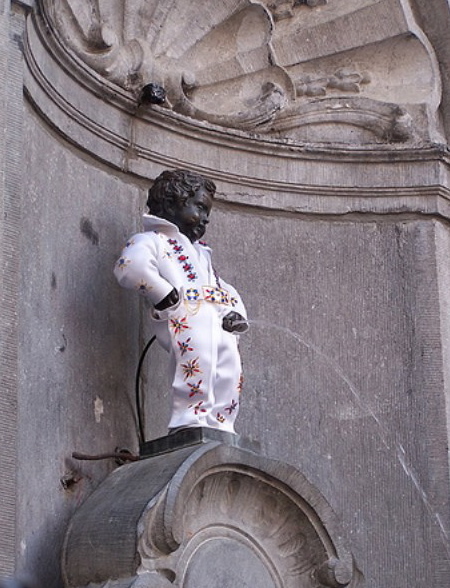 Knowing the legend of Manneken-Pis before you go makes it that much more amusing. There are several tales about the origin of the statue, but the story I was brought up with is that the young son of a Belgian noble once went missing while with his family in Brussels. The nobleman was devastated and the townspeople banded together to find the boy. 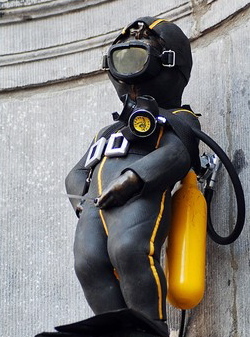 The Belgian noble promised that he would have a statue cast, as a gift to the city, of his son doing whatever he was doing when he was found. The search party found the boy, in the woods without a stitch, relieving himself - and so the bronze was cast. As children we giggled with beguilement and shared gasps at the misfortune that left this poor little boy immortalized in humiliation. Hall. In addition to seeing the permanent costume exhibition, the museum admission fee of only 3€ includes an educational game for children (available in English) about the history of Brussels and comes in a 6-8 year old version and a 9-12 year old version. 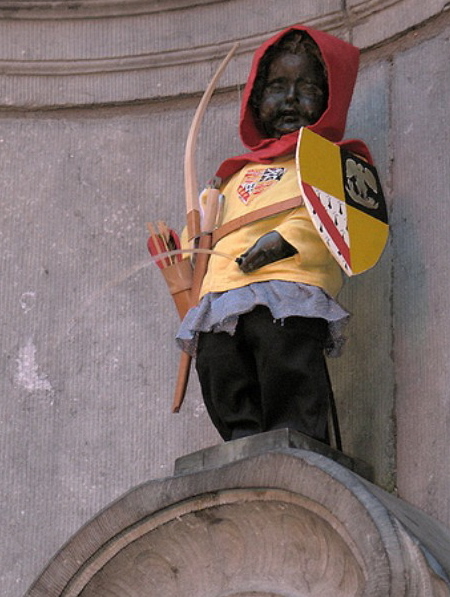 Manneken-Pis is occasionally dressed in his costumes, always in an elaborate ceremony, often accompanied by brass band music. Scheduled dates and times for this all-around family fun are published and posted on the railings around the fountain. 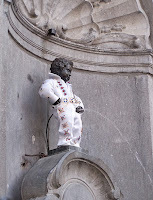 Finally, FYI, you will find little Manneken-Pis, a.k.a. 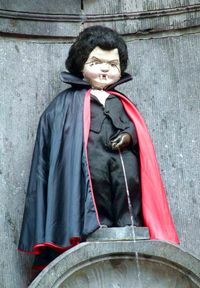 le Petit Julien, at the intersection of Rue de l'Étuve/Stoofstraat and Rue du Chêne/Eikstraat, a short walk down the alley to the left of the Town Hall in Grand-Place. I've seen him and I don't get it. So I keep walking to find the chocolate.